This is a recipe for Greek paximadia, which are a kind of rusk. This recipe includes aniseed, which makes it a wonderful snack or 'nibble'! Put 1 tbsp of aniseed in the water, bring to the boil and simmer for 10 min. Wait for it to become tepid and then pour through a sieve. Dissolve the sugar and yeast in the water. Put the flour in a large mixing bowl and sprinkle the other 1 tbsp of aniseed on top. Make a well in the centre of the four and add the water and then the oil gradually, mixing it into the flour. Add the salt around the edge. Gradually knead the dough well for at least 10 min. If you need more water, then add tepid water. When you have a dough like bread dough, cover the bowl with cling film and leave in a warm place for at least 1 hour, until it has doubled in size. Place the dough on a work surface and divide into 8. Roll each piece into a small loaf 30cm in length. 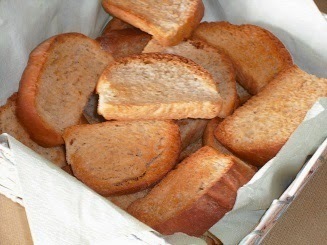 You will need 2 oven trays brushed with oil and place 4 loaves onto each – leaving a gap of at least 5cm between each loaf. Leave the trays uncovered in a warm place for 1 hour. Bake in a pre-heated oven at 180 degrees Celsius for 20 minutes. Take them out of the oven and leave them to cool overnight. Next day, cut the loaves diagonally (not straight across) into 1.5cm thick slices. Place the slices flat on oven trays – you will probably need 4 trays – and put them in a pre-heated oven at 180 degrees Celsius until they are dried – approx. 30 min – and have a golden brown colour.